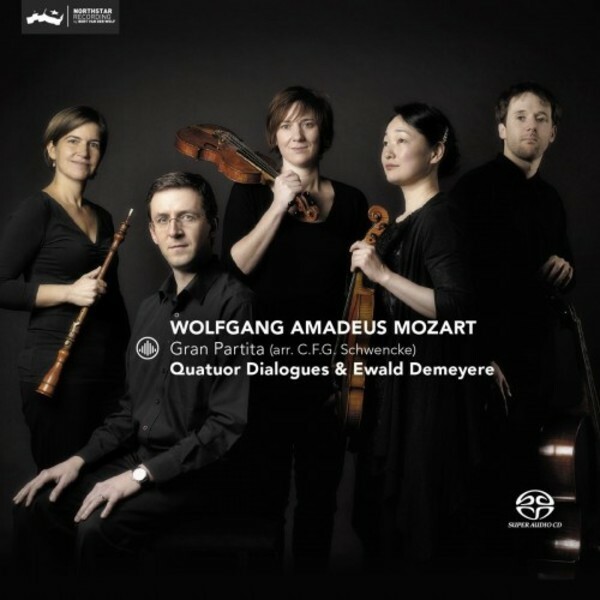 An all-too-rare recording of Mozart’s ‘Gran Partita’ in a contemporary arrangement (1805) for fortepiano, oboe and string trio is performed by Quatuor Dialogues and Ewald Demeyere. The arrangement, made by a Hamburg composer named Schwencke, is a pure masterpiece for its sonic effectiveness and for its successful coherence in representing Mozart’s ideas. This “present period” instrument account stands out in a small field, for its driving energy, for the ever-changing tone of the oboe and the clever role played by the fortepiano. Mozart’s Serenade in B flat major K.361/370a, the so-called ‘Gran Partita’ (not the composer’s appellation), is unarguably one of the greatest works in the wind instrument repertoire. It adheres to the Viennese tradition of Harmoniemusik - music for wind ensembles intended to add lustre to aristocratic events and banquets - yet transcends the genre by its instrumentation, its monumental proportions and the richness of its musical inventiveness. The work is inextricably linked with the figure of Anton Stadler, the Viennese clarinet virtuoso and member of the imperial Harmonie. There is general agreement today that the Gran Partita was commissioned by Stadler, and it was most probably Stadler who, during a concert tour in 1794, provided Schwencke with the score from which the latter subsequently made an arrangement, renaming it ‘Gran Quintetto’. Christian Friedrich Gottlieb Schwencke (1767-1822), CPE Bach’s successor in Hamburg as Stadtkantor and Musikdirector, was renowned for his boundless admiration for Mozart. In order to reach as large a public as possible, he made, and had published, numerous arrangements of famous works by his idol. To replace the 13 instruments of Mozart’s original, Schwencke chose to combine two new complementary media emblematic of this period of chamber music, the fortepiano and the oboe quartet, and he ingeniously redistributed the melodic material amongst the different parts, resulting in particularly varied sound combinations.